The Java log10 Function is one of the Java Math Library function which is used to return the base 10 logarithmic value of given number. In this article we will show you, How to write Math.log10 function in Java Programming language with example. The basic syntax of the Math.log10 in Java Programming language is as shown below. The following function will accept positive double value as argument and returns the base 10 logarithmic value of the specified expression or Value. Number: It can be a double value or a valid numerical expression for which you want to find the base 10 logarithmic value. If the number argument is positive double value, Math.log10 function will return the logarithm of a given value. If the number argument is negative double value, Math.log10 function will return NaN. When the number argument is not a number, java Math.log10 function will return NaN. The Java Math.log10 Function allows you to find the base 10 logarithmic value of a specified expression or an individual double value. In this Java program, We are going to find the same and display the output. First, We declared variable of type Double and performed the Math.log10 function directly on expression. Next, We used the Math.log10 Function directly on Positive double values. 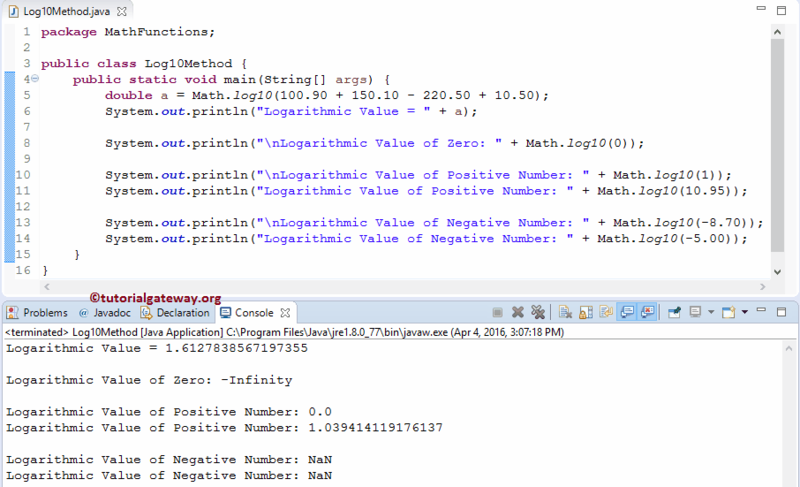 Next, We used the java Math.log10 Function directly on Negative double values. As you can see from the screenshot, it is returning NaN for negative values. In this Java program we will show you, How to find the base 10 logarithmic value of bulk data. Here, we are going to declare an Array of double type and find the base 10 logarithmic value of each and every element in an array. Within this Java log10 function example, First, We declared an Array of double type and assigned some random values. Next, We used the Java For Loop to iterate the Array. Within the For Loop, we initialized the i value as 0. Next, compiler will check for the condition (i < logArray.length). As along the condition is True, statement inside the for loop will be executed. TIP: logArray.length is used to find the length of an array. Following statements will print the output. If you observe the code snippet, we used the Java log10 Function directly inside the System.out.format statement. Here, compiler will call the Java Math.log10 method (static double log10(double number)) to find the base 10 logarithmic value of corresponding values. In this Java log10 program we are going to declare an arraylist of double type and find the base 10 logarithmic value of list elements. Within this Java log10 function example, First, We declared an ArrayList of double type and assigned some random values. Following statements will print the output. Here, compiler will call the java Math.log10 method ( static double log10(double x) ) to find the base 10 logarithmic value of corresponding values.